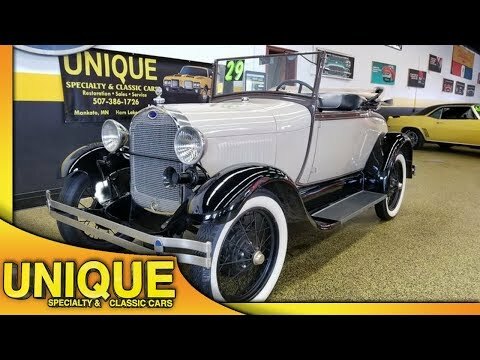 1929 Ford Model A Roadster w/ Rumbleseat! TRADES? Wow, if you're looking for a Model A Roadster in great shape and ready to drive, check this one out! If you take a look at the pictures provided you can see how nice of solid of shape the interior, cloth top, paint, and rumble seat are all in. Our shop went through the car and after some fresh gas and a little TLC this car runs, drives and goes down the road nicely. These A's are still a steady seller for us with the roadster/rumble seat cars being the most popular. This one has a great color combination to it from the interior, paint, on down to the wheels. We don't expect this roadster to last long so give us a call at 507-386-1726 or email "sales@uniquemankato.com" TRADES WILL BE CONSIDERED AND FINANCING IS AVAILABLE.